Community compost at Morning Glory Farm in Edgartown. Vineyard Vision Fellowship will pay for study of how much food the Island throws away. A state ban on commercial food waste has yet to be enforced, but Islanders have taken matters into their own hands by launching a comprehensive study of the issue on the Vineyard. Funded by the Martha’s Vineyard Vision Fellowship, the yearlong study will likely result in a plan for managing food waste on the Island. A seven-member committee recently hired Sophie Abrams of West Tisbury to lead the study. The committee also plans to hire an intern in the coming weeks. The Farm Institute in Katama is the fiscal sponsor for the study, and will manage the $70,500 grant to fund the two positions. The study officially begins in March. Under the state ban, all businesses producing more than a ton of organic waste per week must donate or repurpose it to keep it out of the waste stream. About 1,700 businesses statewide will be affected by the ban, including many on the Vineyard. The regulations may expand to include household waste in the future. But the state as well as the Island lacks the capacity to deal with so much organic waste, and the ban is often ignored. 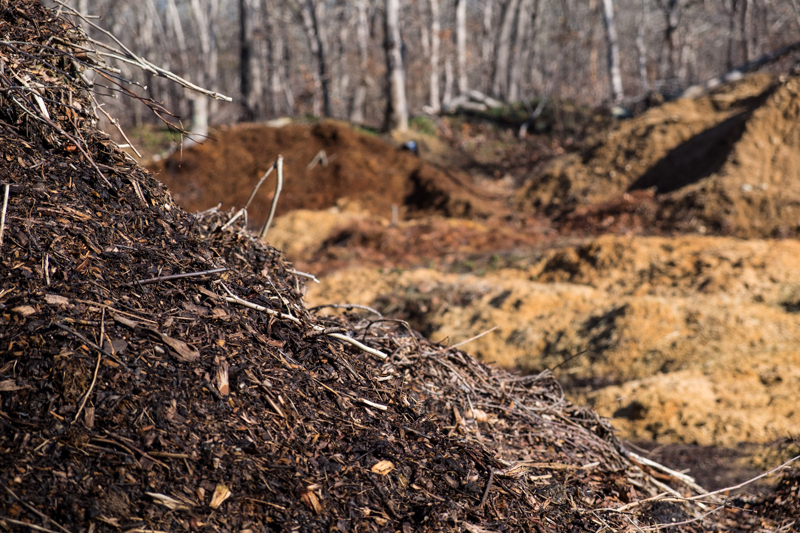 Neither of the two disposal districts on the Island — the Martha’s Vineyard Refuse District and the Oak Bluffs-Tisbury district — has composting facilities at their transfer stations. 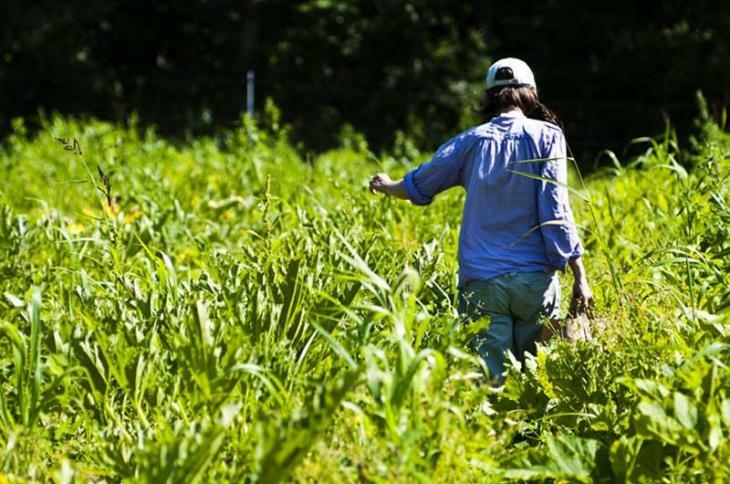 Martha’s Vineyard produces at least 20,000 pounds of potential crop waste every year, according to Island Grown Initiative, which runs a gleaning program to distribute unused produce to Island groups throughout most of the year. Food waste accounts for more than 25 per cent of the garbage in Massachusetts, according to the Department of Environmental Protection, but less than 10 per cent is diverted from the waste stream. The state plans to reduce food waste disposal by 35 per cent by 2020, which would require diverting an additional 350,000 tons of food waste per year. All the permitted composting and anaerobic digestion facilities in the state can accept only about 150,000 pounds per year. Concerns about waste on the Vineyard have gained steam as the population grows and people become more aware of the challenges of waste disposal, especially on a small Island, where nearly all trash is shipped away for processing. Ms. Abrams recently conducted a feasibility study for Island Grown Initiative as a graduate student at Marlboro College, but without a comprehensive study, she said, an Islandwide approach to food waste has remained out of reach. The study will draw from many stakeholders, including farms, businesses, schools and the refuse districts, to paint a comprehensive picture of food waste on the Island and frame solutions. For an Island community, Ms. Abrams said, “being as self sufficient as we can in the future is really important. I think food is a small part of that. Some feel that shipping organic waste off Island may not be the best solution. “Right now everything is going over and being burned and creating electricity for somebody else at a steep cost to us,” said Richard Toole, board president at the Vineyard Conservation Society, who serves on the food waste committee. The Vineyard’s seasonal economy will present a challenge in terms of waste management, since new facilities would need to accommodate a dramatic increase in waste in the summer, when the population expands at least five times over. Melissa Hackney, program director for the Vision Fellowship, sees the study as an opportunity to move forward as an Island, rather than the town-by-town, an approach that she believes has hampered food-waste management efforts in the past. The study will also consider ways to prevent food from becoming waste in the first place. In 2014, Island Grown rescued 24,000 pounds of produce, according to the group’s website, and other strategies may emerge from the study. Mr. Toole suggested that Island restaurants could partner with local pantries to distribute their excess food. A food waste plan will likely benefit the environment as well as the economy. Some see the study as benefitting the health of Island ponds, which have suffered from an overload of nitrogen, mostly from septic tanks, but also from fertilizer runoff and other sources. Because food contains nitrogen, reducing the amount of food waste could also improve the health of coastal ponds, where nitrogen has led to algal blooms and a loss of habitat. “Every time you see a truckload of food coming to Cronig’s or Stop and Shop or whatever, you are seeing essentially an inflow of nitrogen and no outflow,” Mr. Murphy said. One way to reduce the amount of nitrogen entering the ponds, he said, would be to replace commercial fertilizers with Island-made compost. Several committee members, including Tisbury health agent Michael Loberg, helped draft an Islandwide fertilizer regulation program that went into effect last year. Mr. Murphy saw the new study as a step in the same direction. “What we are trying to do is figure out how to make the Island closer to nitrogen neutral,” he said. The study will depend largely on outreach and education, and some aspects of a management plan will likely require town meeting approval. The fertilizer regulations passed almost unanimously in every town last year, and Mr. Toole hoped for similar results following the food waste study. The study reflects a growing awareness on the Vineyard surrounding waste in general. Mr. Toole noted that the conservation society is working to gain support for an Islandwide ban on single-use plastic bags in checkout lines next year, and other efforts to eliminate single-use products. This is a timely article as the MVC is considering a proposal from the MV Refuse District to spend $2.5 Million of MV Residents money (our money) to expand this underutilized facility and it won't be able to handle any food waste. To me this the equivalent of telling MVC Commissioner "Trip" Barnes he has to buy 5 new trucks (for $2.5M) that will sit around the VH Park and Ride rusting and rotting. And oh...sorry Mr. Barnes - these new moving trucks won't be able to haul any of the the things people need to move. Moving trucks probably don't make good food delivery trucks. There is no question the MV Transfer facility could benefit from some re-engineering. We all get that it is not ideal - but it is workable. Please go to the MVC web site to review the current plan: http://mvcommission.org/sites/default/files/docs/DRI%20391-M3%20MVRRRD%20PP%202015-10-19.pdf. Contact them if you think the plan should be paused and re-reviewed for the changing needs of our community. This is the job the MVC is chartered to help us with: affordable, sensible planning. Spending this kind of money on something that misses the mark badly in my view makes little sense. We've got a pretty effective system in place at our landfill. Take a trip over and check it out! On or about February 3rd of this year, France passed a law that mandates all supermarkets (with a footprint of 400 square metres or more) to donate their unwanted food stuffs to charities and food banks. Those who flout the law, face substantial fines. This might mean that eligible supermarkets will sign donation deals with food banks that certainly will improve the quality, and possibly the quantity, of food available to those of need. The UK is now looking into the same issue of the disposal of unwanted food. Unfortunately, I cannot imagine the US entertaining the thought of drafting a law, but this should, at least, wake up and raise the consciousness of supermarkets and other food distributors in finding ways to benefit both Mother Earth ecologically and the low income and very hungry, public. I have been looking at the possibility of doing commercial composting on the vineyard for years including visiting other modern industrial composting facilities. There are two hurdles I have not been able to overcome yet. First and most important is zoning. Without rezoning to create space to legally do this and not be back in front of the ZBA every month I can not make this happen. Second is dealing with the seasonality of the island. A system than can handle the full capacity of the summer load is very expensive but would sit mostly unused in the winter. This is something the towns may be able to help on.